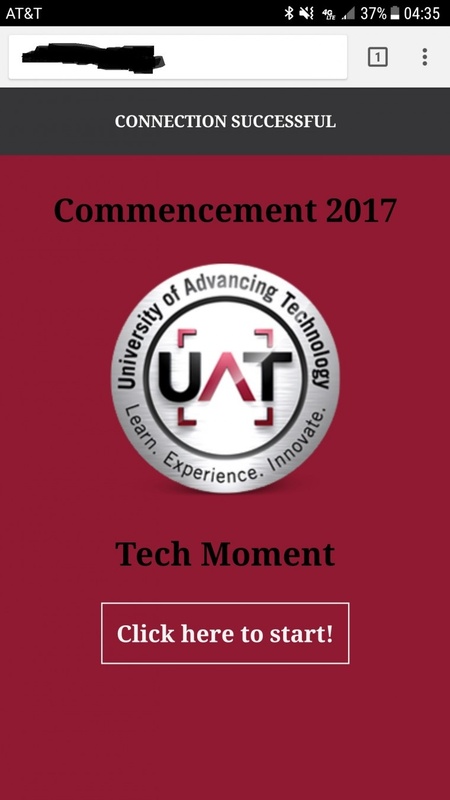 The UAT Commencement is coming up at the end of theis semester (May 5th), and there is a traditional "Tech Moment" at each graduation. I am super happy to be part of the team that built this year's tech moment! 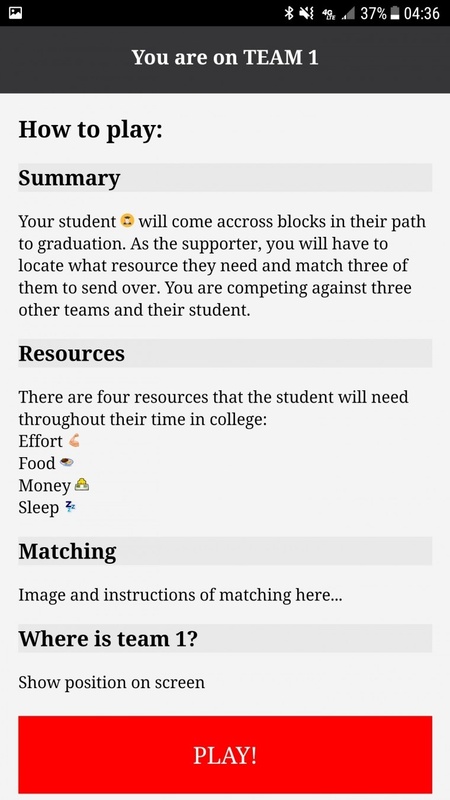 Out group decided to make a collaborative mobile game where everyone has to match a resource that the student needs and send it. 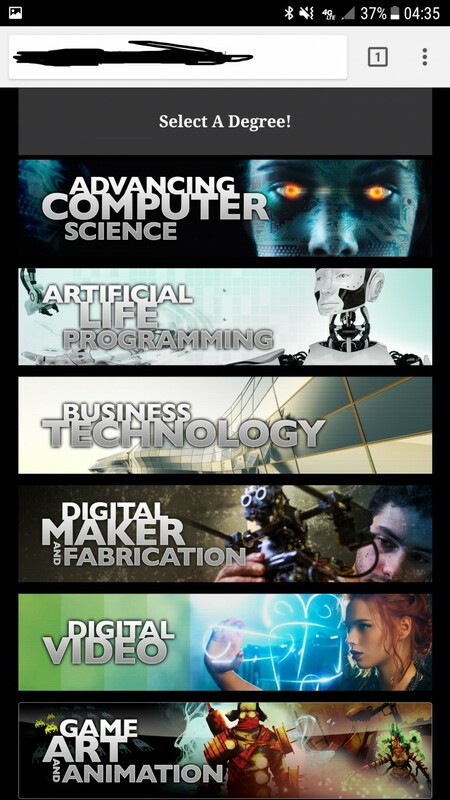 Users will log on to our site and choose the major of the student they are there for. The majors will be grouped into teams to compete. On a large screen, players will be able to see their student go through school and run into obstacles. The player will then have to match what resource they need to overcome that obstacle and send it. Each team must do this as fast as they can to see their student graduate first! This project is made up of three main parts: the user's phone, a database, and the Unity engine. From the beginning, we knew this project would function best offline, so we made it a priority to develop this whole system to work without an internet connection. Instead, users will connect to our own network where our server will host the web pages for the user. We didn't want to rely on internet or cellular connection because things can go wrong. We also chose to build web pages instead of an app because more people are willing to go to a website than download an app for a one time thing. Apps would also require an internet connection, the user searching for our app, and the time it takes to download. We've DNS'd our own URL for user to go to on our network where it leads the user to the home page. They will then select their major, read some instructions, and play! The webpages call and submit information to the database. The Unity engine then pulls the information from the database to interact with the game. We also built in balancing functions so if there is a population imbalance between two teams, one team will not have an advantage over the other. I took over the web portion of the project. The home page is a simple "connection success" page with the UAT logo. They then tap "Start" to go to the degree selection page. Our game is built of four teams, and originally we were going to get the user to select one of the general teams that closely apply to the student's major, but that may cause some confusion because people may fall in more than one category or the parents may not know exactly what the student does. Instead, I have a page with each major on it, and behind the scenes it will direct them to one of the four teams with other similar majors. It also makes it look much nicer. I'm not going to post the actual game page until after commencement. The pictures above are still in development, as well. As you can see there is incomplete information on the last page, but I wanted to show off the general idea. I will also be hosting this content myself after commencement so anyone can go take a look at it and interact with it. I will post where to find more information about this project, the actual show day, and the hosted site soon!